Christ Dying on the Cross by Jean Morin is a print of exceptional visual power and historical significance. Morin, with Claude Mellan, was the most admired and prolific printmaker in early 17th-century France. Unlike Mellan, however, who worked in pure burin in an idealizing style, Morin combined etching and engraving to achieve a naturalistic effect. His works convey peculiarities of appearance, variety of texture, and modulation of light with extraordinary sensitivity. Most of his work is portraiture, establishing the format and function that would dominate the genre for the next 150 years. At the same time, his landscapes were the most refined of their time. Yet most impressive are his large-scale interpretations of religious subjects by Philippe de Champaigne, a painter closely associated with the austere Catholic reform sect, the Jansenists. Christ Dying on the Cross is the largest and most striking of these interpretations. It recreates Champaigne’s celebrated Crucifixion of the Jansenists, painted before 1650 for the Charterhouse of Paris and today in the Musée du Louvre. There are two versions of the print. One, created from three plates, reproduces the entire composition of the painting. Showing the rocky mount of Golgotha and the location of the cross, the three-plate composition is a strict translation and thus traditional in iconography. The present variant was printed from just the upper two plates to produce a work of nearly square format and distinct meaning. With the cross filling the frame and seemingly suspended against a distant background, this interpretation offers a transcendental image that would have elicited the most devout contemplation. Morin’s transformation of the painting’s appearance is just as striking. Typical of Champaigne’s style, the canvas is imposing and remote. In the print, Morin’s mixed technique, personal vocabulary of mark, and sheer sensitivity infuse the figure of Christ with a sensuousness. Contour appears more variable and muted, flesh more nuanced in description and tactile in appeal. Throughout, the range and gradation of tone seem even greater than in the painting. Stark and dramatic in Champaigne’s work, light seems fine-grained and warm in Morin’s print. This subtlety of observation and technique imparts a poignancy and underscores the human aspect of the figure. 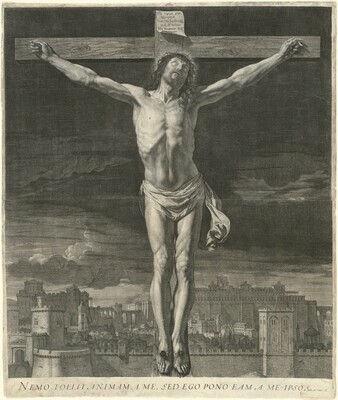 Christ Dying on the Cross is a print of utmost rarity. The recent catalogue raisonné of Morin’s work records just two impressions of the three-plate version, both in the Bibliothèque Nationale, Paris. The catalogue describes the two-plate version but does not cite the location of an impression. This one is the first to enter an American public collection. (sale, Ader Nordmann, Paris, 4 March 2011, no. 22); (C. G. Boerner, New York); purchased 2012 by NGA.